Integrative genomic approaches to decipher the molecular mechanisms underlying cancer progression and to identify novel targets or disease pathways for therapeutic intervention. Our laboratory focuses on understanding the genetic and epigenetic pathways to prostate cancer. A number of key transcription factors, including the Androgen Receptor, the Polycomb group protein EZH2, and the TMPRSS2:ERG gene fusions, have been related to epigenetic changes and implicated in prostate cancer. However, their downstream pathways remain largely unknown. Using 'omics' approaches we have identified a number of target genes and molecular pathways of these transcription factors. Our study will elucidate the specific pathways of these transcription factors and how they may crosstalk with each other to form an intertwined network. Findings from our study will then be applied to understand the hormone-refractory prostate tumors and help the design of novel therapeutic targets. 04/05/2019: New paper published in Cancer Research: Activation of MAPK signaling by CXCR7 leads to enzalutamide resistance in prostate cancer. 03/29/2019: New paper published in Asian J Androl: Transcriptional repression by androgen receptor: roles in castration-resistant prostate cancer. 03/14/2019: Feinberg School of Medicine Research Newsletter: Uncovering Genetic and Epigenetic Pathways to Prostate Cancer. 01/23/2019: Feinberg School of Medicine news: Study Suggests New Strategy to Treat Advanced Prostate Cancer. 12/14/2018: Feinberg School of Medicine news: New Understanding of Enzyme’s Role in Prostate Cancer. 12/04/2018: Feinberg School of Medicine news: New Therapeutic Target Identified in Prostate Cancer. 12/03/2018: New paper published in Cell Reports: Polycomb- and Methylation-Independent Roles of EZH2 as a Transcription Activator. 12/03/2018: New postdoc Dr. Guihua Zeng joined us from University of New Mexico. Welcome, Guihua! 12/01/2018: New paper published in Journal of Clinical Investigation: Targeting FOXA1-mediated repression of TGF-β signaling suppresses castration-resistant prostate cancer progression. 11/27/2018: New paper published in Nature Communications: TRIM28 protects TRIM24 from SPOP-mediated degradation and promotes prostate cancer progression. 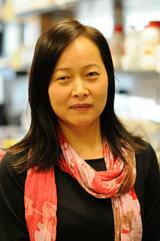 10/23/2018: Jindan is named Assistant Director for Education and Training at the Lurie Cancer Center. 04/17/2018: New paper with collaborators published in EMBO Reports: PRDM4 mediates YAP-induced cell invasion by activating leukocyte-specific integrin β2 expression. 02/26/2018: New postdoc Dr. Tan Song joined us from Capital Normal University, Beijing. Welcome, Song! 02/05/2018: New paper published in Nature Communications: BMI1 regulates androgen receptor in prostate cancer independently of the polycomb repressive complex 1. 01/15/2018: Dr. Xiaohai Wang joined us from Shanghai General Hospital as a Visiting Scholar. Welcome, Xiaohai! 10/16/2017: Bioinformatics postdoc Dr. Gang Zhen joined us from Peking University, China. Welcome, Gang! 09/11/2017: New postdoc Dr. Xiaoyan Zhu joined us from Marquette University, Wisconsin. Welcome, Xiaoyan! 08/25/2017: Dr. Angela Yang has graduated and joined Jackson laboratory as a postdoctoral fellow. Congratulations, Angela! 08/17/2017: New paper published in Cancer Research: PADI2-mediated citrullination promotes prostate cancer progression. 06/01/2017: Rakshitha Jagadish from UIC joined the lab for her Master thesis project. 04/01/2017: Galina Gritsina joined the lab as a DGP gradaute student. Welcome, Galina! 03/20/2017: New paper published in Oncogene: FOXA1 inhibits prostate cancer neuroendocrine differentiation. 03/07/2017: New paper published in Cell Reports: CD95/Fas Increases Stemness in Cancer Cells by Inducing a STAT1-Dependent Type I Interferon Response. 02/01/2017: Nathan Damaschke joined the lab as a postdoctoral fellow. Welcome, Nate! 11/04/2016: New paper published in Cancer Research: Polycomb-mediated disruption of an androgen receptor feedback loop drives castration-resistant prostate cancer. 09/01/2016: New postdoc Dr. Yongik Lee started in the lab. Welcome, Yongik! 08/31/2016: Dr. Jung Kim has graduated and moved back to Maryland to join NCI as a CRTA fellow at DCEG. Congratulations, Jung. 08/26/2016: DGP graduate student Kevin Park joined the lab. Welcome, Kevin! 07/26/2016: Will is awarded Katten Muchin Rosenman award. Congratulations! 07/12/2016: Will is selected to receive the Heme/Onc division Rizvi travel award. Congratulations! 06/07/2016: New paper published in Mol Endocrinol: KAT8 regulates androgen signaling in prostate cancer cells. 06/01/2016: New paper published in Nucleic Acids Research: FOXA1 potentiates lineage-specific enhancer activation through modulating TET1 expression and function. 05/04/2016: New paper published in BMC Genomics: The common stress responsive transcription factor ATF3 binds genomic sites enriched with p300 and H3K27ac for transcriptional regulation.